Years ago, through no merit of my own, I ended up at a lunch table with Elder Neal A. Maxwell and then-Elder Thomas S. Monson. Both were great students of World War II and knew the names of the commanders in the European Theater by heart. At one point, Elder Maxwell said he'd read that a certain general had gotten himself into trouble by taking a mistress. 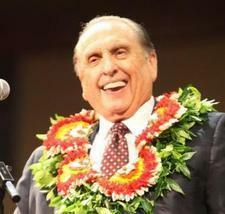 President Monson got that famous look of feigned surprise, a look that let you know something good was coming. "He was such a homely man," he said, "I'm amazed he could find one woman, let alone two." The facial expressions of President Monson are worth a thousand words. And they usually show up when he's telling a funny story or talking about his boyhood.